For much of the 21st century, states have put increasing energy into better understanding teacher development and quality. (Or, as wonks might say, “The inputs and outputs.”) Through expansive policy solutions and evaluation systems, there have been varying degrees of success in ensuring as many students as possible have highly qualified and effective teachers leading classrooms, particularly for historically disenfranchised students. As part of New Mexico’s effort to raise the floor on teacher quality, while not lowering the ceiling of possibility, The Land of Enchantment put NMTeach in place starting in the 2013-14 school year. 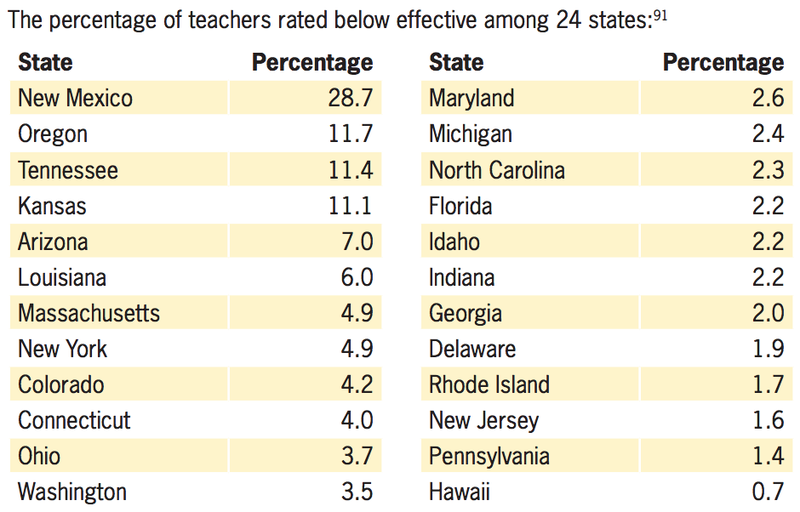 Since then, most public school teachers receive an annual rating, ranging from “exemplary” to “minimally effective”. Contentious from the start, NMTeach was our first meaningful, statewide attempt at a standard evaluation of teacher performance incorporating student learning. The student learning piece remains the single most debated aspect of NMTeach. As noted in the report, NMTeach student growth originally accounted for 50 percent of a teacher’s rating but last year that was reduced to 35 percent. New Mexico must do a better job at identifying and directly supporting teachers. While ratings provide helpful information, districts, NMPED, and schools must better align targeted support to specific PD areas. Sometimes the deficiency is in practice, sometimes in curriculum, and other times with dysfunction school administration not providing meaning professional learning. Ultimately, a rating is a rating, meaningless in vacuum. (Particularly in New Mexico where personnel decisions are not made based on a teacher’s rating due to a lawsuit from teachers’ unions.) What I listen for is a how districts, schools, and educators respond to evaluations. Their self-beliefs about growth and learning speak volumes about their approach to students. I know “highly effective” teachers dissatisfied with their own personal achievement, determined to spread their wisdom beyond the four walls of their classrooms. Many of these same educators have valid critiques of and recommendations to evolve NMTeach forward. I respect these folks immensely. I’ve also heard from educators who believe any attempt to tie student learning to their evaluation is a “sham”. Perhaps they’ve had a terrible experience with NMTeach or their district’s approach to it. Or perhaps they haven’t escaped the union echo chamber that shoots down genuine efforts to improve schools though accountability and choice at every turn.